I've mentioned my love of films and movie nights in on my blog a few times and on social media too! I love watching a film, snuggled up with a blanket, comfort food and friends or family; it's such a relaxing, cozy *and yes, hygge* experience. I have a lot of favourite movies, some of which may be quite geeky but I love them, including: the Harry Potter series, the Lord of the Rings trilogy and anything directed by Tim Burton, particually the Batman films from the 80's, Beetlejuice and Sleepy Hollow. I watch most movies online via Netflix but it's great to have a dvd too as then there's no buffering! On 5th September 2016 Warner Bros UK. 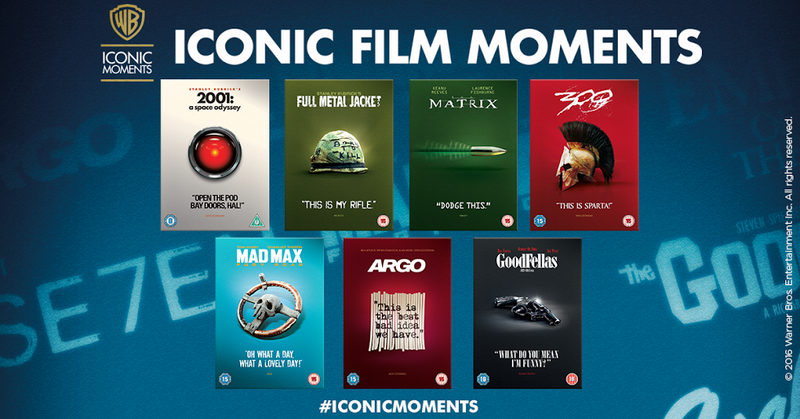 launched the Iconic Moments Collection, a beautifully matching packaged set of 22 standout titles celebrating the breadth of their catalogue, including classics such as Charlie and the Chocolate Factory (the original which is one of my favourite childhood films), Gremlins, the Matrix and 300, as well as many others. I love the unique and tricking DVD artwork for this new collection and I think they'd make great christmas gifts! "There is no life I know to compare with pure imagination. Living there, you'll be free if you truly wish to be"
"Time is a precious thing. Never waste it"
"I don't understand it. The children are dissappearing like rabbits. Well, we still have each other. Shall we press on?" "Freedom isn't free at all, that it comes with the highest of costs. The cost of blood"
Have you watched any of the films from the Iconic Moments collection? What are your favourite film quotes? This is Sparta became one of our school trip catch phrases one year after watching it on the coat journey haha! 300 was a surprisingly entertaining movie.